This Tuesday night I’ve got a cracking show to kick off the new year, featuring a super exclusive live set chock full of glitch hop and bass-heavy breaks from Buck Fillington (aka 3-Parts DJ of Thump fame). This set was recorded live at the Hot Cakes Boats ‘n’ Hos Christmas Boat Party that took place on the Thames in London last month, where young Buck damn near capsized the boat with his glitchy beats and heavy bass. You’re gonna love it! As well as that cracking live set, I will be spinning my usual selection of fresh beats and classic grooves, including brand spanking new tuna from Ils, Eats Everything, Justin Martin and loads more. 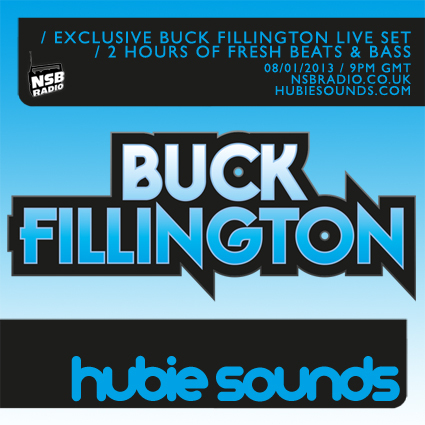 Hubie Sounds 060 – Tuesday 8th January @ 9pm GMT – live and direct on NSB Radio! This entry was posted on 7 January, 2013 at 11:45 am and is filed under Live Radio. You can follow any responses to this entry through the RSS 2.0 feed. Responses are currently closed, but you can trackback from your own site.